Marissa Weatherhead is primarily a painter of still life, however, she is also a landscape painter. Born in 1962, Marissa studied mainly at the Royal College of Art and at the Gloucestershire College of Art and Design where she obtained a first class degree in Fine Art. Marissa's landscape work is more figurative and fluid than the structured approach in her still life work. 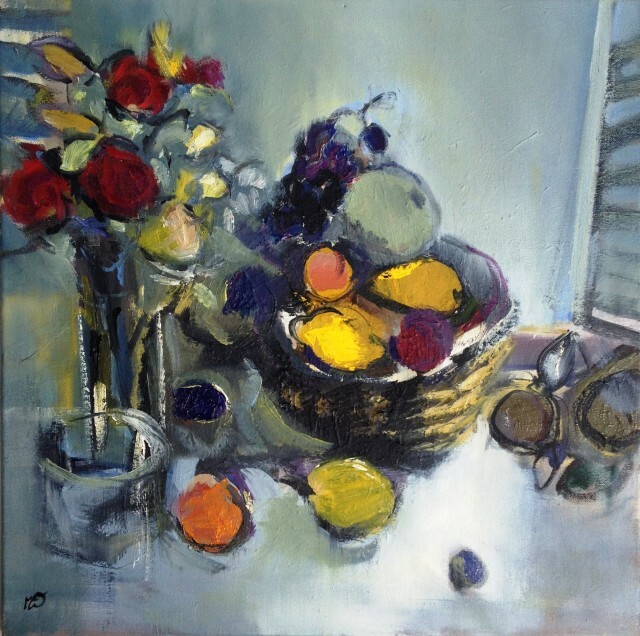 She says of her still life work, ‘These paintings use familiar objects to investigate space, colour, form and composition. They do not deal with direct observational representation; instead they use and concentrate on what we know about an object through knowledge and visual understanding. This approach enables me to play on visuals by flattening or fragmenting the images or simplifying them at will, pulling and pushing space and form. A simple line or a block of colour depict an image. This evolution of the painting is evident in the build up of paint and use of mark making. By continually pushing the painting around it forms layers and textures until finally it reaches its conclusion'. Marissa's still life paintings owe something to the Cubist paintings of Braque and Picasso (whose work she admires greatly), but her greatest inspiration comes from the more arabesque influence of Matisse. Marissa has exhibited widely both in Ireland and England, as well as in Europe. She was awarded the Boise Travel Scholarship, John Minton Award in 1988 and her work is in the Arthur Anderson collection.